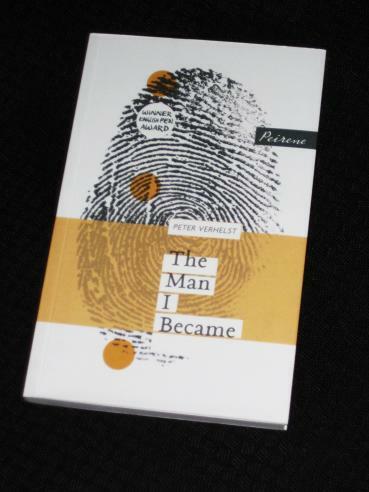 Peter Verhelst’s The Man I Became (translated by David Colmer, review copy courtesy of the publisher) begins with a narrator looking back at his origins, recounting his abduction from a far-away land and an arduous journey across deserts and oceans which ends with his arrival in a new world. A tale of woe many migrants (or slaves…) could tell, but the mere fact of his being able to articulate his experiences is what makes this one stand out. As we later discover, our narrator is a gorilla, and he has been brought across the sea to work at Dreamland, a fantastic amusement park – once, that is, he has been domesticated and educated. Initially, he is just one of many among his ‘family’, but it soon becomes clear that he is destined for great things. He adapts to human society quickly and is chosen to help organise and coordinate the show at the heart of Dreamland, a mesmerising spectacle of evolution which has gone beyond the level we’ve reached today. The more he learns, the more praise (and rewards) our friend receives, moving him closer towards the goal of being recognised as human. However, you can’t completely tame the animal inside, and it will only take a reminder of his origins to make him question the importance of his new life. ‘What does DMCC mean, sir? asked the female human in a small voice, as if she was one of us. ‘The DMCC,’ said our human, is the Dreamland Maritime Cleaning Crew, in the hands of the Carcharodon carcharias family, also known as the Great White family. Most readers of The Man I Became will approach the text looking for allegories as it’s hard to read the book without thinking of both the slave trade and colonisation. The animals here are being ‘civilised’ using the stick-and-carrot approach, with those who do well enough striving to be accepted by the people who brought them to their new home. There’s also a strong sense of Heart of Darkness here (apt for a Belgian novelist); the narrator’s story is almost a mirror image of Kurtz’ journey into the heart of the African interior, and just like Conrad’s protagonist, Verhelst’s simian hero gradually becomes disillusioned by what he finds. I went down the fire escape. ‘What are you doing here?’ the security guard asked, one hand in the pocket where he kept the shock rod. At this point, it appears that all the hard work has been worth it – he has finally been accepted into a new ‘family’. Sounds – well, great actually! I’ve only read one Peirene so far, with two on Mount TBR, but I think I’ll put this top of the list of possibles! Kaggsy – I’ve read… eighteen 😉 Only one I haven’t got to yet (still trying to track down an affordable French-language copy…). I recently won this in the PeiQuiz, but for some reason I’ve tended to wait until all three Peirene Press books are out in the last couple of years and then read them all. It does seem like they are now trying to include one which is more light-hearted /quirky. Grant – Definitely this one and ‘Reader for Hire’ (although I wouldn’t say this is all light-hearted…).